The invasion of Normandy (code named Operation Overlord), also referred to as D-day, occurred June 6, 1944. The initial date set for the landings, was June 5, but because of bad weather, General Eisenhower delayed the assault by one day. More than 150,000 Allied troops participated in the landings, and airborne assault. General Eisenhower meets with airborne troops, the day before the Normandy invasion. The first view many troops had of the beaches of Normandy, was through the drop down door of their landing craft. Many died before they even reach the beach. These American troops were wounded during the assault on Omaha beach, on D-day. They are being treated, and are waiting to be evacuated. These Americans reached Utah beach in a life raft, after their landing craft was sunk. June 6, 1944. A single rifle stuck in the ground, with a helmet on top, marks the spot where an American soldier lost his life. Beside the lonely tribute lies a box of ammunition. 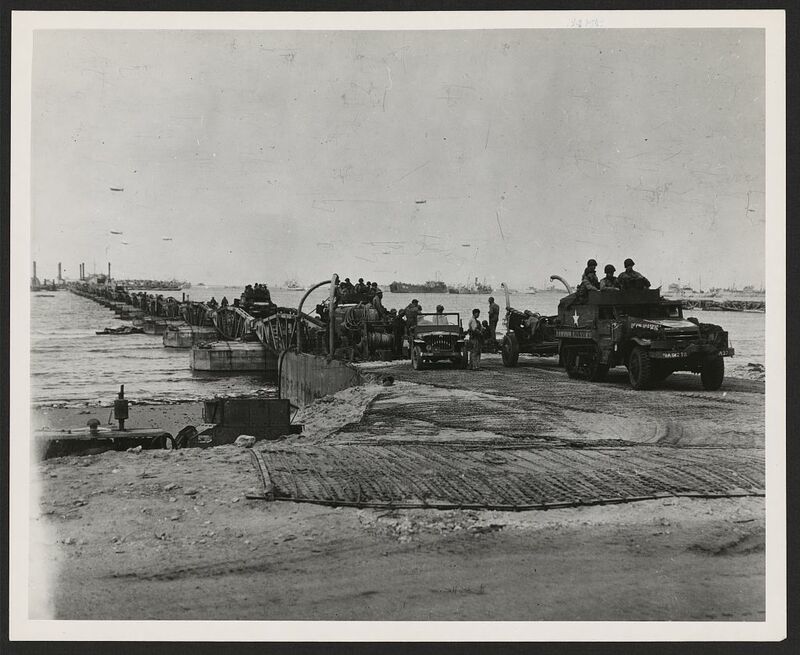 As part of the Normandy invasion, prefabricated harbors were erected, which allowed easy access from ship to shore, for vehicles and supplies. The view here, is of Mulberry harbor.